What types of services and repairs does your shop offer? Brake Noise? Rattling muffler? The air-conditioning is on strike again? 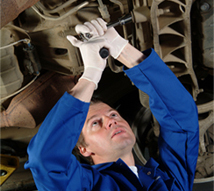 Or just need general automotive repair/maintenance? These are all problems that the professionals at B&C Auto Center San Jose are happy to solve for you. Also, when you bring your vehicle into B&C Auto, in addition to the initial work you requested, we will complete a 35-point courtesy vehicle inspection by one of our certified technicians. It is our goal to keep you well informed of your vehicle's condition and allow you the opportunity to have any potential problems repaired before they become more serious. We work on nearly every kind of vehicle (foreign and domestic) and we will keep all of your vehicles well maintained with a service tracking system that will make your life a little easier. We will have all of your vehicles' history at our fingertips so that whenever you have a question just give us a call. Need a ride? Just ask us for a shuttle and we will be happy to give you a ride back home or to work. Our many clients appreciate the special service we offer at B&C Auto Center. Thanks to our comprehensive services you can come to us knowing you are bringing your car to a trustworthy repair shop for any car repair problems.